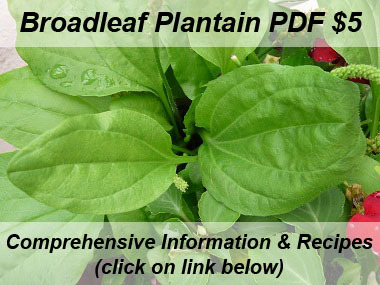 Broadleaf Plantain is a perennial broadleaf plant that grows in many locations from spring to autumn. 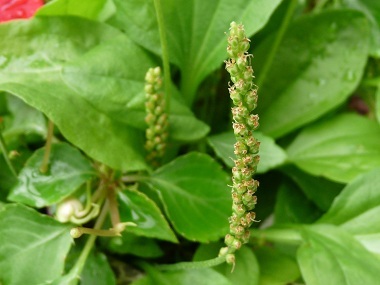 Not only is this a vital wild edible plant for overall good health, this wild weed can be used to treat chronic diarrhea as well as digestive tract disorders. 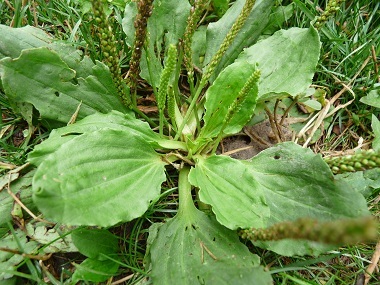 Broadleaf plantain is packed with nutrients and is safe to ingest. If a person chomps on some fresh leaves, these can be applied to the skin to treat minor burns, insect bites or open wounds. 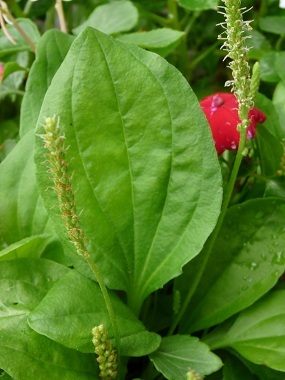 Distinguishing Features: Broadleaf plantain has green, oval to egg-shaped leaves that grow in a rosette. These leaves have thick stems that meet at a base. When these stems are broken, they reveal string-like veins that resemble those in celery. 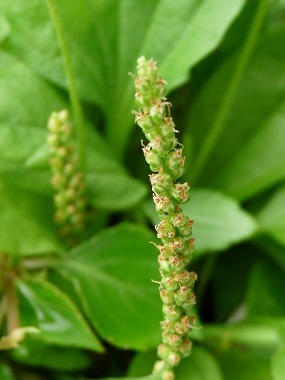 Long-pointed, green, petite flowers grow from the base; these also contain a small pod housing dark seeds. Flowers: Plantain flowers occur in compact spikes on erect, leafless stalks from among the basal leaves. Each spike is about the size and shape of a pencil but consisting of many, tiny, stalkless, greenish flowers giving it a coarsely granular texture. Each flower measures 2 to 3 mm (1/12- 1/8") across. Each flower has four petals, two stamens, and one pistil. Egg-shaped seedpods develop beneath the withering flower.Flowers from spring until late autumn. 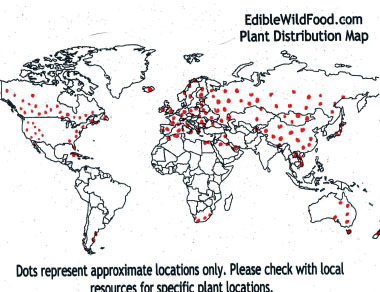 Fields of Nutrition has medicinal benefits and vitamin/mineral content of Broadleaf Plantain. Leaves: The leaves grow in a rosette and can range from 5 to 30 cm in length. Plantain leaves have stems that contain string-like veins and these veins are seen on the leaf. There are five to seven prominent parallel veins from the base. Leaves are generally broadly lance-shaped to egg-shaped, are hairless or sparsely short haired. Height: Can grow to a height of 12cm. Habitat: Can be found growing throughout Ontario and most of North America as well as in Europe and Asia in meadows, pastures, lawns, roadsides, gardens, and waste places.